Getting a rodent - which rodent is right for me? Before you get a rodent, it is important to think of whether a rodent suits you and if so, which rodent is right for you. This depends on the amount of care and space the animal needs, and whether you are choosing an animal to cuddle with or just to look at, whether it is a herd animal or one that can be kept individually. It is also important to realise that some rodents may look cuddly but unfortunately aren't, and are therefore less suitable as pets for children. Some rodents are reasonably tame, but this does not apply to all rodents. The life expectancy of the various rodents varies wildly, and this is also an important consideration. Chinchillas or guinea pigs can grow much older than hamsters, mice or rat. It is also important to think of who can take care of your pet when you go on holiday. Rats and guinea pigs are mainly tame animals that can also be picked up. 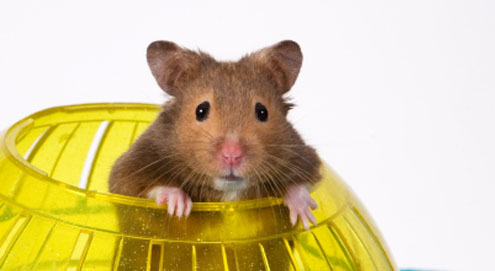 Mice, dwarf hamsters and gerbils on the other hands are difficult to manage and therefore less suitable for children. Chinchillas do not like to be handled too much either. Based on the above, rats or guinea pigs are most suitable for people who have not had a rodent as a pet before. The choice of whether to have a male or female depends on the rodent type that you choose. Females can usually be kept together (especially from a young age). Putting several males together on the other hand is not always successful. For example, male mice and gerbils do not work well together. Chinchillas, guinea pigs and rats may be able to live together when this is done from a young age and there are no females around. Usually, males and females can be kept together, provided that the male is castrated. If you want to put two adult animals together, contact must be built up slowly and carefully. For example, you can start by putting both animals into separate cages where they can see and smell each other. You can then put them in the cage together with a barrier between them so that they can have contact but can't fight. When this goes well for a number of days, you can put both animals together while you supervise them. Of course every animal needs daily care. It should be fed, given clean drinking water and the cage must be cleaned on a regular basis. The amount of time spent caring for your pet depends on your choice of rodent. For example, hamsters are "house trained" and will only do their business in a small patch of the cage. You can teach rats to do the same. Guinea pigs, on the other hand, will soil anywhere in the cage and this will make it more time-consuming to clean the cage. (Male) rats and mice can spread a strong odour and will need to have their cages cleaned more frequently. Another example is that gerbils produce very little urine and therefore their cages will not need to be cleaned as often. Unfortunately, most rodents are kept in cages that are too small, which can lead to stereotypical behaviour. Mainly chinchillas are sensitive to being in the wrong cage. It is therefore very important to check what your pet needs, as animals need to be able to engage in their natural behaviour. Most rodents are herd animals. In order to meet their needs, these animals will need to be housed with at least 1 other of the same species. If you only want to keep 1 pet, hamsters and fat-tailed gerbils are among the most suitable. The cage must be set up in a way that provides for the animal's basic needs. These basic needs include sleeping, eating & drinking (looking for food), hiding, investigating its environment (climbing/digging) and contact with other animals (in case of herd animals). As most rodents are also prey, they don't like open spaces without cover. That is why it is a good idea not to put their food and drinking bowls at the centre of the cage, but in a slightly more sheltered spot. Provide plenty of hiding places in the cage. Hamsters love to dig, so they like a cage with a thick layer of sawdust (preferably at least 15cm). Rats, mice and chinchillas are real climbers and therefore enjoy having several floors in their cage. Guinea pigs actively dislike climbing and mainly need a large surface and therefore enjoy being given the run of the house or garden from time to time. What's more, hamsters and chinchillas love to keep their coats clean by bathing in sand. That's why it is a good idea to provide a "sand bath" in the cage. Chinchillas prefer really fine sand, special ‘chinchilla bath sand’. Some hamsters may use the sand bath as a toilet, so you should clean the sand bath on a regular basis or provide two different sand baths. Gerbils are like having sand baths, which they use as toilets. A hiding place should not be see-through, in order to allow the animals to really hide away. Gerbils like to have a little house with a tunnel-like entrance. For example, hamsters also like to have a place to store their food, so a house with different spaces is great, especially if it doesn't have a floor so that they can dig. You can replicate nature as much as possible by using different litter types (check which types are suitable for your pet) as well as placing rocks, ropes, twigs or houses in the cage. This gives your pet plenty of climbing and playing options that it would also have in nature. An exercise wheel is great for keeping your pet moving. The side of the wheel must be closed and cannot have slats, as the animal can get stuck in these. The nutritional needs of all rodents vary wildly. Gerbils and chinchillas are originally desert animals and therefore should not be given too many fruits and vegetables that contain too much moisture. Chinchillas have a sensitive gastrointestinal tract and it is therefore important to know exactly what they need. For chinchillas, a special Chinchilla pellet is recommended, +/- 20-30 grams daily. To reward your pet, you can give them a small piece of dried fruit (raisin, apple), but never give your pet moist fruit or vegetables, peanuts or nuts. Gerbils need a complete food suitable for small rodents, including gerbils specifically, as a base food. The daily recommended quantity is approximately 10-15 grams. You can supplement this with some fruit and vegetables (preferably dried). Animal proteins are also important. You can give these in the form of dry dog or cat food or a mealworm every now and then, for example. Rats are natural omnivores. They need a special rat food. You can also give them a piece of fruit or vegetable as a treat. Mice are omnivores too. They need a food made for small rodents including mice. These rodents can also be treated to a piece of fruit or veg. Guinea pigs cannot product their own Vitamin C and need special guinea pig food that contains plenty of this. Unfortunately, the amount of Vitamin C in the food is reduced after some time and may not provide the guinea pig with enough Vitamin C. Storing the food in a dark, dry and airtight place can reduce this reduction in Vitamin C, but we recommend that you buy small bags of food that do not need to be stored for long. To be on the safe side, you should also give your guinea pig half a 50 mg tablet of Vitamin C a day. The daily recommended amount is approximately 20 grams daily. You can supplement this food with various fruits and vegetables. A hamster needs a complete hamster food. The daily recommended quantity is 10-12 grams per animal daily. It is important for all rodents not to choose mixed food, because they will start eating very selectively. It's better to give them a "pellet" food containing all of the necessary nutrients, such as the Supreme Science Selective range. It is also necessary to always give all rodents plenty of fresh hay all the time. What's more, all rodents have an urge to gnaw. You can use willow branches, birch or wood from fruit trees. Gerbils, chinchillas and rats should not be given gnawing and licking stones, as this may result in bladder stones. In the overview, you can find the characteristics and needs of a number of rodent types. This may help you in your choices. Expansions for the Ferplast hamster & mouse cages. Hanging house for rodents and ferrets. Natural hiding place for small rodents. Sheltered area to take a sand bath. Brightly-coloured play tunnel for ferrets & kittens. Modern cage for (dwarf) hamsters or mice. Exercise wheel with a great natural look.